Fox News enters 3-year contract with Juan Williams | can i just finish my waffle? 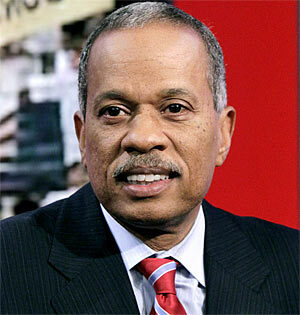 FOX news network signs Juan Williams to a new three-year contract for nearly $2 million. Meanwhile, conservative figures blast the public radio network for its response to Williams’ comments about Muslims. I’m waiting on Obama to speak out in defense of Juan Williams and one of the “values we hold so dear” and tell the National Public Radio they acted stupidly. Silence. NAACP – silence. Al Sharpton – silence. He was fired for saying muslims in airplanes make him nervous. Gee, how horrible is that, huh? Somehow Juan has gotten on the wrong side of the gustapo. Jerry Brown, on the other hand, can call his opponent a whore and he gets a reward – the endorsement of NOW, the National Organization of (political) Whores. Great, more liberal spinning by Williams on Fox. I will not watch. What is the big deal that he got canned by the mentally ill libs at NPR? You sleep with dogs, you get fleas. Juan has constantly stood up and agreed with every liberal issue for years so that payback to him is par for the course. I am more interested in the upcoming elections…gotta get Reid out. It just shows how vicious they are. Maybe Juan will see them for what they are. Ms. Shiller has already attacked him personally, which is what they do, of course. He can see what it feels like to be lied about. Did you see where Soros gave npr 1.8 million dollars? I think Reid is going to lose, I really do. Won’t that be sweet!! He is now saying he saved the World. I saw that Mika and Joe were in Alabama this morning. Why are they sending them out on the road? Leaning forward and bending over I guess. I think Mika was having severe shock. People do not like her liberal a$$. Joe either for that matter.